Linux users have a large repertoire of tools at their fingertips for figuring out the current workload on system resources. You may already have used tools such as iostat and netstat . These and other tools are either intended only for professionals or solely for the purpose of displaying parts of the desired parameters. 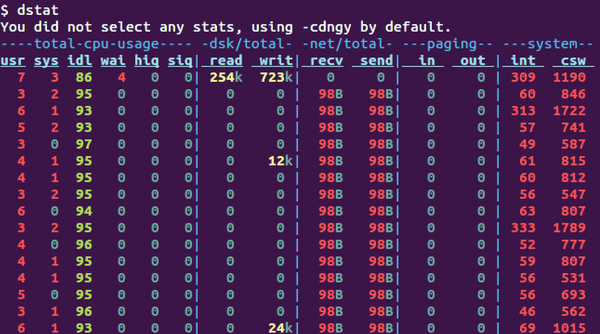 The dstat tool, on the other hand, can be used by both novice and experienced administrators, because it offers well-structured and colorful information output. Therefore, with only a little practice, a less experienced user can detect processes causing significant loads on the system. Dag Johan Maarten Wieers from Belgium was the primary developer for dstat, which is written in Python. Originally, he intended for the program to bring the functions of the well-known tools ifstat , iostat , netstat , and vmstat together in one place to give the user a comprehensive view of network disk and memory status. The tool also includes numerous extensions that display metrics for many different applications. Although the kernel provides the standard measurement values in the usual way via a virtual proc filesystem, the software has its own modules to read the measurement values for applications. The program is available for installation as a binary package for all current distributions. If necessary, you can tie in additional sources from the community when the package is not in the repositories of the distribution you are using. On Debian-based systems that don't come with the package already installed, just use the sudo apt-get install dstat command for adding the dstat package. It is usually known by the same name on other distributions as well. The package manager for the distribution easily takes care of installation. Typically, the Debian package deposits the program in /usr/bin/ . The modules that deliver actual functionality are found chiefly in /usr/share/dstat/ . When called, the software relies on modules from this directory. If you want to write your own extension for the program, this directory contains many helpful examples. Dstat has numerous options for reading out only that information which is relevant for the moment. If you call the tool without further specification, then it will behave as if you had combined the -c , -d , -n , -g , and -y options (Figure 1). You can get additional information about the use of various options by calling the manpage via man dstat . See also Table 1. Figure 1: If called without parameters, dstat will deliver a set of values that may make it possible to get an initial impression of bottlenecks. The program displays the desired values in the form of a table and preserves constant widths for the columns. The choice of colors is optimized for dark backgrounds. An option exists to switch via --bw to a design for light backgrounds or via --nocolor to a monochromatic display. The first lines of output echo the implicitly activated switch. The following line names the five large areas behind which the individual options are found. AccordinglyB in the example from Figure 1, the program shows the metrics for the condition of the CPU, hard drive, network, and memory. During testing, the system was basically running in idle. Therefore, the use of the color red, as seen in the last column in Figure 1, merely serves to provide a better overview rather than an indication of any problem. However, dstat utilizes color changes inside a single column to indicate altered conditions such as the switch from idle mode into full load. The color green is therefore not necessarily indicative of a healthy condition, because the program sometimes uses colors randomly. To end the program, you only need to press the Ctrl+C keys. If you know from the beginning how long you want the program to run, you can specify this when you call it. For example, the program will run for 5 seconds with the call dstat 1 5 and update the output in intervals of 1 second. Figure 2 once again shows the areas CPU and System with -c and -y , respectively. Additionally, dstat displays the development of the Load , or -l , as well as those processes,--top-cpu , which use the most CPU resources. For a system with multiple processors and cores, the tool summarizes the workload of all of the CPUs. If you would like to have a detailed report, you can use the -C option together with a comma-separated list of the cores that should be monitored. Figure 2: In addition to standard CPU metrics, the example indicates which process eats up the largest share of computing time. The first column of the output for the CPU describes typical values measured by the tools. These include usr and sys , which indicate what percentage of the used CPU time was spent in user and kernel space mode. The idl column contains the percentage of unused CPU capacity. This last value is especially important for purposes of determining whether there are potential issues. If it is high, than the system is idle. The values designated by the abbreviation wai indicate whether programs are waiting to execute. If these values are high, then it is possible that a bottleneck has formed. The columns labeled hiq and siq show the number of interrupts caused either by hardware or software. A high number of interrupts indicates heavy use of the system but it would not necessarily mean that a problem had occurred. The system field is divided into the int column for the total number of all interrupts and csw for context switches. The latter deals with all processes that due to multitasking have been paused because another process has CPU priority for execution. If the number of paused processes is higher than normal, this can indicate that the CPU cannot keep up with executing with the tasks at hand. However, this holds true only if the idle time value referred to above is close to zero. The third large field load-avg shows the system load for the last 60 seconds, the last 5 minutes and the last 15 minutes as reported by the kernel. In a Linux system, the load value serves as the standard indicator of whether the system is overloaded or idle. The software determines the load values by checking how many processes are waiting for execution on a particular CPU. 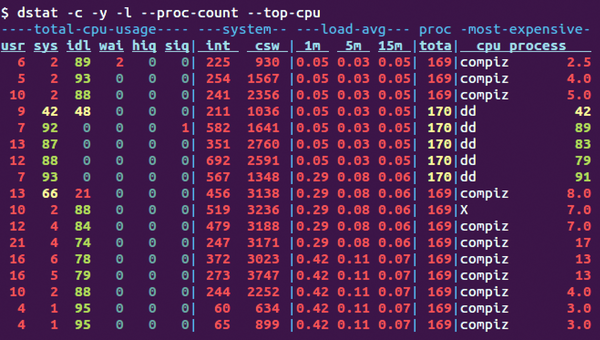 The next column proc indicates the current number of processes that are running. The last column most-expensive shows which process is currently using the most CPU resources. As long as the load remains smaller than the available processing cores, the computer will be half asleep. When the load reaches a size that is more than twice that of the available cores, problems will arise. This means the CPU can no longer handle the tasks at hand. Each value in a row represents a snapshot for the most recent second. If the CPU measurements are unexpectedly high, then it is a good idea to take a closer look at the memory usage. Many programs communicate over the network, and when a bottleneck occurs, these tools can help you determine the cause.